The Atari XF551 disk-drive is one of the most innovative and confusing products released for the 8-bit computer line in quite some time. It was produced to take the place of the discontinued Atari 1050 disk-drive, and since its release, a controversy has raged, with some people condemning the XF551 while others praise it. The first things you will notice about the XF551 is that it is shorter and wider than the 1050, incredibly quiet (and with no power light, you can't tell if it's on or off without attempting to access it), and comes with the same old Atari DOS 2.5. This last point has generated mass confusion and still does, many months after its release. The Atari XF551 is a double-sided, doubledensity disk-drive, making it capable of storing a full 360K per disk, smashing the 130K barrier imposed on the 1050's double density mechanism with "enhanced" or "dual" density. The confusion stems from the fact that Atari DOS 2.5 can only handle singlesided, single- (88K) or enhanced-density (128K) disks. Since it comes only with DOS 2.5, people assume it is merely a clone of the 1050 drive in a new case. The XF551 is in tact capable of handling 360K disks with the right DOS, namely DOS-XE (formerly ADOS), from Atari. This product was developed by Optimized Systems Software (now owned by ICD) and completed ages ago, but it still has not been released because of "delays in printing the manual," according to Atari sources. The story behind "the new drive with an ancient DOS" is that Atari was sued by Nintendo over its XEGS. 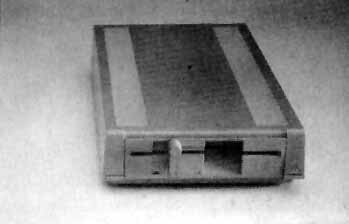 Nintendo disputed Atari's claim in the XEGS advertisements that you can attach a disk-drive and use it as a real computer. This is true, but Atari had no disk-drives for six months or more. Apparently, when the suit was filed, Atari decided to ship the XF551 with the old DOS 2.5, since DOS-XE (or the manual for it) was not complete. The suit was dropped, and we finally got new disk-drives. The problem is that you will waste over 200K of disk space on each and every floppy if you are still using the old Atari DOS! "Wait a minute. I can just flip the disks and format the bottom side." Is that what you were thinking? It won't work. The XF551 uses a timing light at format time only. When you flip your floppy, the timing hole is on the wrong side. The XF551 doesn't see the timing pulses from the timing hole and refuses to format the flip side of the disk. This may seem rather bizarre when you realize that the disk-drive does not use the timing hole at any other time. When the disk is formatted, timing is written on the disk. The timing hole is used for nothing but the prevention of formatting the flip side of a disk. This limitation is quite logical when you think about it, however. If you have been using an 810 or 1050 disk-drive, you have probably been formatting the flip side of your floppies for years. Suddenly you start using double-sided, double-density, 360K disks. (Atari assumed you would have a DOS that could do that, of course.) Wouldn't it spoil your day if you inadvertently formatted the flip side of a full 360K diskette? This is where the timing light prevents you from making a serious mistake. Writing to Side 2 of the disk in the XF551 has confused a lot of people. If a disk is formatted as double-sided, then forget about it. The DOS will keep track of what is on which side. The disk always goes in the drive face side up. You never flip it to read the backside, nor is it "written backwards" as many people fear. This confusion stems from the fact that we have been flipping disks for so long. If a disk is formatted single-sided, any density, on both sides (by a 1050 or 810 for example), it is the same as two completely separate disks. Each side has a complete directory and file set. If a disk is formatted double-sided, it is one disk made up of two sides, with only one directory for all files on both Sides 1 and 2. Because the XF551 refuses to format the flip side of a disk, this does not mean the XF551 cannot read and even write the flip side of disks already formatted this way. If you have a huge library of flippies, the XF551 will be able to manage them with no problems. I have been using my XF551 for about six months now, with no significant problems. I have put SpartaDOS and SDX to good use, getting a full 360K out of every floppy without having to flip it all the time. This is ideal for storing large amounts of data, such as backing up a hard drive. My XF551 has trouble formatting some of my "plain label" diskettes, claiming that as many as two in ten are bad. However, nearly all of those "bad" disks formatted on my IBM PC-AT compatible computer with no problems. (Note: The PC can recognize bad sectors, remove them from the directory map, and still make a completely usable diskette. On the Atari, one bad sector means the entire disk is bad, so far as the format function is concerned.) I have had absolutely no problems formatting brandname diskettes such as Verbatim and Maxell, however. The "plain label" disks which did format correctly gave me no problems reading and writing later. If you have the disk version of Flight Simulator II, or other commercial programs with similar copy-protection schemes, they will not run on the XF551. The XF551 runs at exactly 300 RPM, while the 810 and 1050 drivers hover close to 288 RPM. Some of the newer, more sophisticated copy-protection schemes use the disk speed, which they expect to be 288, and refuse to run if it varies. It is ironic that Flight Simulator II comes in a cartridge with the XEGS, with the capability of reading FSII scenery disks. However, the newest Atari 8-bit computer, the XEGS, cannot use the newest Atari disk-drive, the XF551, to read them! I have not had any significant problems with this different disk speed, and have not heard of any other programs besides FSII refusing to run in the XF551. In summary, the new Atari XF551 is fast, quiet, and capable of 360K per diskette-no flips required (or allowed, for that matter). Until DOS-XE comes out, you will need SpartaDOS or MY-DOS to take full advantage of its storage capabilities. The power switch is at the rear, which is a real pain for users with a computer hutch. The XF551 can be fussy about the quality of the diskettes you feed it. You may have occasional problems with copy-protection schemes, but it's doubtful. The "limitation" of not being able to format flip sides of disks is actually a feature to help break you of old habits. Once you begin using double-sided, double-density disks, you will never want to format a flippy again. I can heartily recommend the XF551. It has no quirks, just a lot of end-user misunderstandings due to lackluster support from Atari. Use the XF551 with SpartaDOS or SDX for a high performance disk-drive package, the perfect upgrade for your system from that ancient 810 disk-drive that's been gasping, wheezing, and clunking along for too many years.